It is now a straightforward task to integrate the FX100 Analyzer into your automated environment, as the master or the slave device. The analyzer is able to accept digital triggers to start a measurement and to acknowledge the result back to the controller. During a measurement sequence, the analyzer can control other devices by creating digital output signals. FX-Control is the controlling software provided for free with the FX100 Analyzer. The software can be configured to run a repeating series of events in a sequence. This sequencer is purpose-built for your production process. For example, switch on warning lights, start an external device, import or export data, call an external software application or automatically create a report. A selection of hardware modules (digital I/O, analog I/O and speaker impedance) can be slotted in to the FX100 to meet your needs, and to minimize the wiring required for external shunt resistors or amplifiers. This simplifies the system operation. The FX-Control software is intuitive even for operators without previous experience, allowing a straightforward setup of even the most complex test. 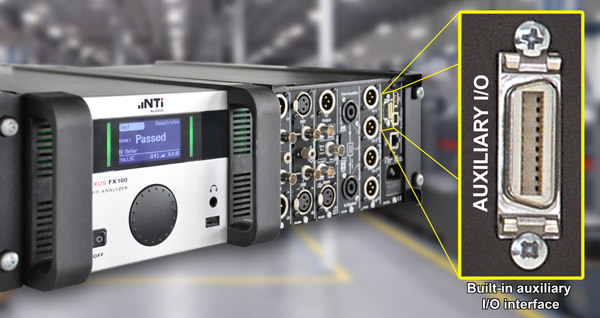 An adaptor to convert the built-in auxiliary I/O interface to a screw terminal block makes the FX100 suitable for all digital connection types. An optional footswitch for triggering actions and a stack-light for display of test results are also available.